During the holiday season, the fireplace becomes the centerpiece of time spent with family and friends. If the hearth is the heart of our homes, then it certainly deserves to be dressed up for the occasion. Transforming your mantelpiece into a festive display offers a chance to showcase your personal style. Here are our tips to help guide you in creating a custom mantelpiece display that will WOW. The fireplace is the focal point of the room, so start by choosing a single item that will serve as the central focal point of your arrangement. Choose something that will draw the eye: a mirror that can play with the light, a wreath that rekindles fond holiday memories, or a piece of art you love that deserves to be showcased. If you have a television mounted above your mantel, consider instead a pair of larger items that will anchor your display on either side. They don’t have to match or even be symmetrical, but you want to move the focus away from your TV and towards your beautiful objects. Your focal point piece or pieces will help establish the overall style of the display: formal or informal, traditional or modern, a rustic winter wonderland or luxe and glamorous. A Bonus Tip: Arranging your mantelpiece for the holidays doesn’t mean you need to wipe the slate clean and remove all of your year-round decor. By including some of the items you usually display, you’ll provide a sense of balance, a feeling of home, and a familiar background for your pops of holiday spirit—they’re the ensemble, and your holiday additions are the stars. Arrange greenery—real, faux, or non-traditional greens like succulents—to add fullness and dimension to your mantelpiece display. Consider incorporating candles and lights: battery-operated strings will let you skip the unsightly cord. Ornaments and pieces made of glass or metallic materials can bring in extra sparkle. Books, leather boxes and organic or natural pieces like pinecones and berries can provide a variety of textures and seasonally appropriate colors. Patterned pottery or ribbon can supply a splash of interest and are an easy way to emphasize a color scheme. Tip 3. Group items wisely. Gather like objects in different colors, shapes or sizes for a striking visual effect. These could include a grouping of small presents, candles or tiny decorative pieces. Arrange objects symmetrically on the mantelpiece for a more traditional look, in an unbalanced fashion for a rustic feel or spaced widely for a sleek, modern vibe. Even if you’re aiming for symmetry, vary heights to add interest and group items in odd numbers. The “rule of threes” suggests that groupings of three (or five, seven, and so on) produce a more visually-appealing, memorable design. 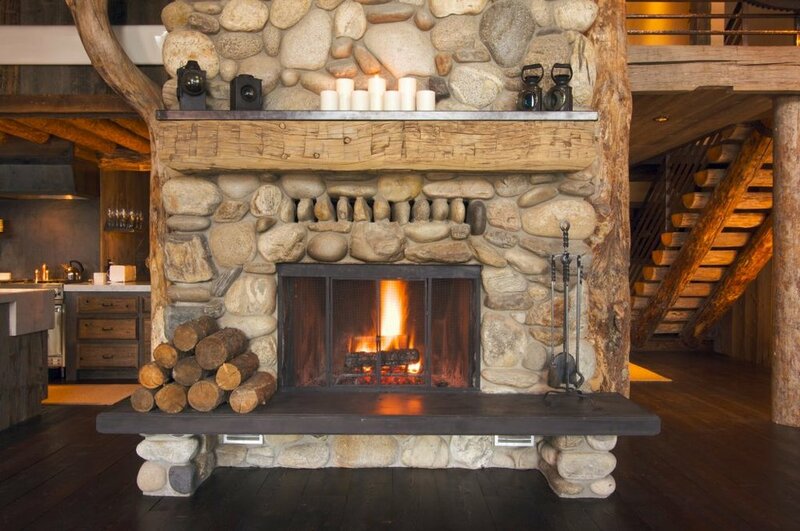 A bonus tip: Balance your mantelpiece design with some hearth decor. An attractive stack of firewood, a pile of wrapped gifts, a vintage sled leaning against one side, a big basket of cozy throw blankets, a gorgeous urn or even a small holiday tree can add another layer of holiday spirit to an often overlooked corner of your fireplace. With a little artistry, you can create a mantelpiece that sets the tone for your home’s holiday season and serves as a central place to gather and celebrate. It will be ready for warm fires, cozy nights and all of your family’s treasured holiday traditions. If you’re looking to expand your collection of holiday decor, or want advice on how to arrange the objects you already own and love, stop by our Geneva showroom for inspiration to shop our curated selection of holiday home goods and to see these design tips in action.